It’s hard to avoid clichés when photographing protests (and many published images I see haven’t tried) but I do my best. 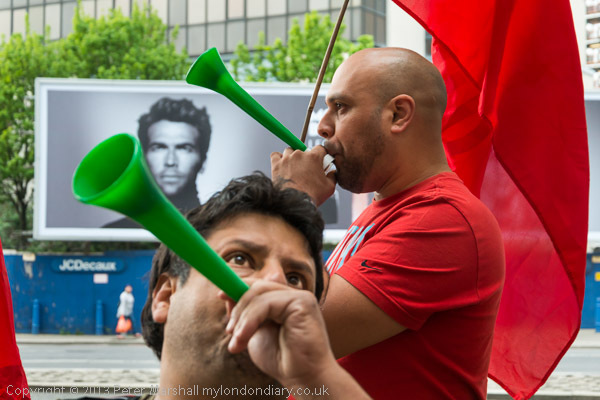 The cleaners are good to work with because they often pull little surprises and their protests are particularly active events, though every time I get to one I remember that I meant to bring ear plugs, as they really do make a lot of noise, as I think the image above suggests. 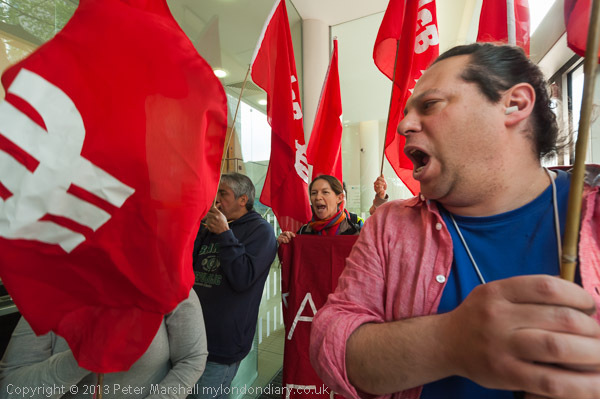 Cleaners Return to Capgemini shows their second protest outside the company’s offices in Vauxhall, where they say they are treated like dirt, paid the minimum legal wage – recognised to be insufficient to live on in London – and that the largely Spanish-speaking workforce are subjected to racist comments by their ISS manager. They call for fair and decent treatment by their employers, saying, “We are not the dirt we clean!” And saying this and other slogans loud and clear and again and again between bursts of blowing on trumpets and whistles, banging on saucepan lids and generating noisy feedback from a powerful megaphone, the whole protest to a background of heavy drumming. 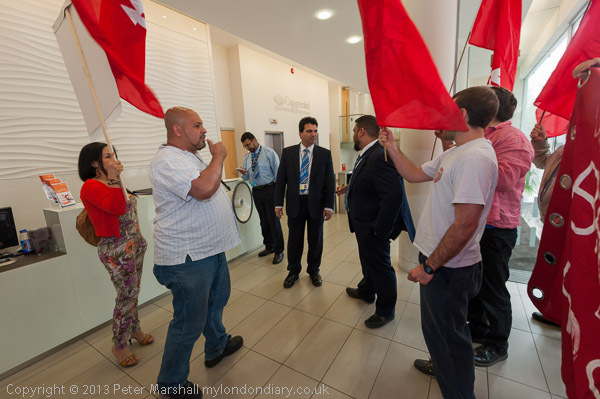 Mostly they do this outside on the pavement, but early in the protest they took the opportunity to go inside the office foyer for a few minutes until they could no longer ignore the requests from the security to leave – and did so. Later in the protest they tried to enter the building again, but stopped when a man and a woman stood in the doorway and refused them entry. They stood in the entrance way for a minute or so, with the cleaner’s leader Alberto Durango talking with the man – I took a few pictures from outside through the glass, but it was rather dirty, and by the time I’d got out a handkerchief and wiped it, the confrontation was over. Unlike on the first protest here in March, there was no visible police presence until the protest was almost over, when a car drove up and two officers went in to the building to talk to those inside. Capgemini hadn’t called the police – and quite sensibly not, as there was no real threat to the people or property in a legal and well-ordered protest, and no point in escalating the situation. But I later found that a man working nearby had, and he came to watch what they did. When I talked to him he seemed unreasonably upset about the noise that the cleaners were making, telling me they should protest in silence so as not to disturb him, and he was making threats to get something done about it. I did photograph him but didn’t think it necessary to put his picture on the web. It certainly was noisy. 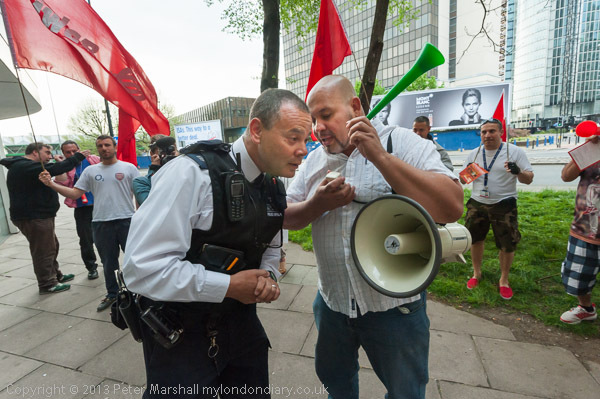 I’d moved in close when the police officer went to talk to Alberto but hadn’t expected quite the intimate tête-à-tête shown here, as the officer moves close to hear what Alberto is shouting into his ear over the background noise. I was only a few feet away but couldn’t hear, but I think he is saying that they will end the protest in a few minutes – it lasted altogether for around three-quarters of an hour. You can read more about the protest and see quite a few more pictures that tell the story of the protest on My London Dairy. I hope there aren’t too many clichés among them. This entry was posted on Monday, May 27th, 2013 at 07:34 am and is filed under My Own Work, Photo Issues, Political Issues. You can follow any responses to this entry through the RSS 2.0 feed. You can leave a response, or trackback from your own site.